Heads up! 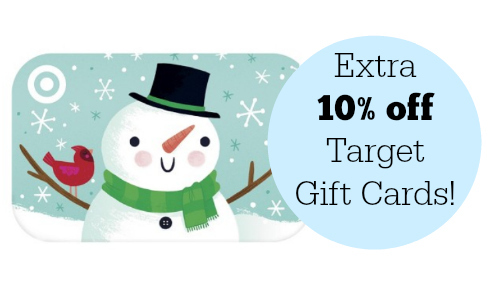 Target is offering 10% off all Target gift card purchases tomorrow. The deal will be available in-store and online Sunday 12/3 only. The limit is $300 in gift cards (which means $30 in savings). They make great gifts but you can also stock-up to get 10% off your groceries. The minimum purchase is $10. The gift cards will be active starting 12/4. Note: Offer does not include Target Visa Gift Cards, Target MasterCard Gift Cards, Target American Express Gift Cards and gift cards issued by other retailers. Deal is valid 12/3 only. Want to save an additional 5% on all of your Target purchases? Sign-up for a Target RedCard.